Over the years I have made lists of my favourite albums. I have kept 5 of those lists, the earliest being from 1982, the latest from last year. In every one of those lists Deadlines has made the top 10. Among Strawbs albums only Hero And Heroine has a better record. Given that Bursting At The Seams was more commercial, Deep Cuts more instantly appealing, Ghosts and Grave New World had better songs, and Burning For You a better cover, this may seem to many an odd choice. Why do I keep going back to this, the most reviled Strawbs album? "Sealed With A Traitors Kiss" - The first time I heard this I thought it was slightly mawkish. Now I think it's a great song and it should be more popular - after all Phil Collins built half his career on songs like this. "Words Of Wisdom" - Once again you can hear the words "no return" in the lyric. Slow and atmospheric. I always imagine this as Dave Cousins meeting the old man from "The Journeys End"
Which is what we have reached. I don't suppose I will have convinced anyone that Deadlines is the second best Strawbs album, but I hope you'll all give it another listen. Although Deadlines was in fact a more progressive album than any to appear after Ghosts, I never really saw it that way. The prog on Deadlines is light years away from that to which we had grown accustomed in the early to mid 70s. It has a metallic edge in places that had barely been hinted at previously, and somehow seems darker even than Hero And Heroine. This is perhaps not surprising given the lack of commercial success and perhaps a disillusionment with the whole industry, but the production may have had something to do with it. Deadlines sounds like Strawbs trying not to sound like Strawbs, which is practically an impossible feat unless you keep Dave Cousins out of the vocals or have his voice drowned out a little more than normal, both of which were attempted here. Not surprisingly, the best tunes are those which fail in this attempt, specifically "Joey And Me", "Sealed With A Traitor's Kiss" and "The Last Resort". In particular "Joey And Me" has to rank as one of my favourite examples of folk and roll, up there with Lindisfarne's "Court In The Act", and is a pretty sweet song about friendship. Because Joey became richer than Dave, I theorized that maybe he represented a well known figure in British rock, like maybe Bowie, but maybe it's no-one we know? "No Return" has a nice beginning and verse but the chorus and keyboard ending represent a low point and major departure for Strawbs, one of the most tuneless passages in their history, and not handled well. "A Boy And His Dog" on the next studio album, at least in order of release, did this a little better courtesy of some great licks by Brian Willoughby. "Time And Life" has some nice mellotron but is just too much of a downer. The other Lambert-sung tunes aren't bad but they are a little too poppy. "Deadly Nightshade" and "Words Of Wisdom" both demonstrate some of the old fire and drama but seem somehow incomplete or half baked in comparison to epics like "Ghosts". If I may jump ahead chronologically a moment, this tendency was even more pronounced on Heartbreak Hill. There, for those of you who think I love every Strawbs album that ever came out, a lukewarm review, and one of the group's weaker efforts, but still not a bad disc! When I saw Deadlinescheaply available at a Long Island store I was amazed. All the trouble getting better Strawbs CDs at remotely reasonable prices and we get Deadlines. Of course I had to have it.I couldn't belive it was released when I couldn't begin find the great stuff like Ghosts etc. at the time. The cover was designed by Hipgnosis, who, at the time the record was released, was THE cool record design house, having done work for many of the big groups of the time, such a Pink Floyd, Genesis, Paul McCartney, Hawkwind, Roy Harper, Black Sabbath, and a host of other notables. The idea for the art is based on multiple puns for the word *deadlines*. The cover features a guy who's drowning in a phone booth. He's going to be *dead* while talking on the phone *line. * In the background, there are more phone lines. The back cover of the original album shows more telephone lines receding into the horizen. In the background, a car's coming. At the time the album came out, Hipgnosis wasn't cheap, presumably. So Arista was most likely positioning Strawbs as a commercial-sounding prog-rock band. Deadlines was a real disappointment when it came out. And the worst thing was that it flattered to deceive. The first side of the LP (tracks 1-5) are actually really good and I remember feeling very positive about it; but side two was such a downer by comparison. At the time It thought it sounded like a long farewell and, in a very real sense, it was. However, I did think that "Joey and Me" was brilliant, and I have regularly played that track in the twenty-odd years since the album was released: definitely one of The Strawbs' greatest hits for me. I can remeber the band playing it on Noel Edmonds' Saturday morning TV programme - Noel was always a big Strawbs fan. I really thought that "Joey And Me" was going to be a hit: had it come out two years earlier, before the punk explosion, I think it would have been. Incidentally, I also really like "I don't want to talk about it" - Dave Lambert's vocals are excellent on this and I love the arrangement. Deadlines has always been one of my favourite albums. Side two, particularly, is a suite of songs that hold together perfectly for me. Listen to Lambert's guitaring on "Words Of Wisdom", could have easily have been Fripp on an 80's King Crimson album. 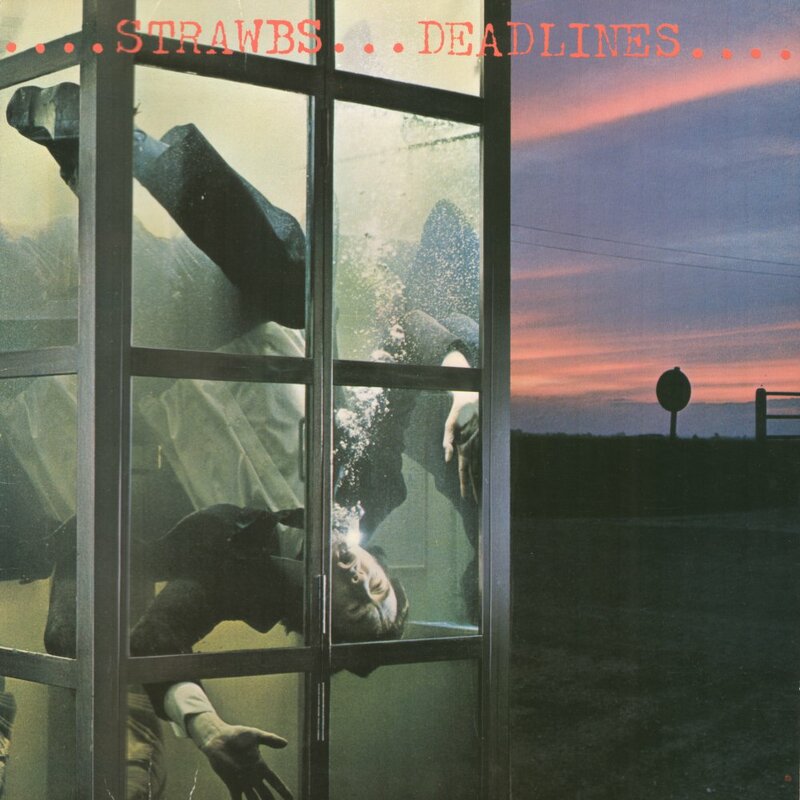 Deadlines is and will always be a very weak Strawbs album. The sound is not any good on the album that I have, the orchestra/strings arrangements are so loud that both Dave's singing is for nothing. There are 2-3 cuts I listen to from time to time. But I think that album should never seen the daylight. Strawbs could/can so much more if they want to. Not a dead album, but the change in style that was starting to show in Burning For You is in full swing here. With Jeffrey Lesser producing (and according to many of you producing a lesser Strawbs album), Tony Fernandez drumming, a definite shift in keyboard sounds (that seems to lead right to Andy Richards' door), and the increased use of Dave Lambert's talents, there is a decidedly un-Strawbs-like element in the results. Whereas "Joey and Me" and "Deadly Nightshade" are the lifelines back to the sounds of the Nomadness thru Burning period, "The Last Resort" and "New Beginnings" are the most successful with the new sound of "The Ultimate Strawbs" as Arista was calling them. The rest of the songs are awkwardly somewhere between the two, with really great touches but just not quite working.